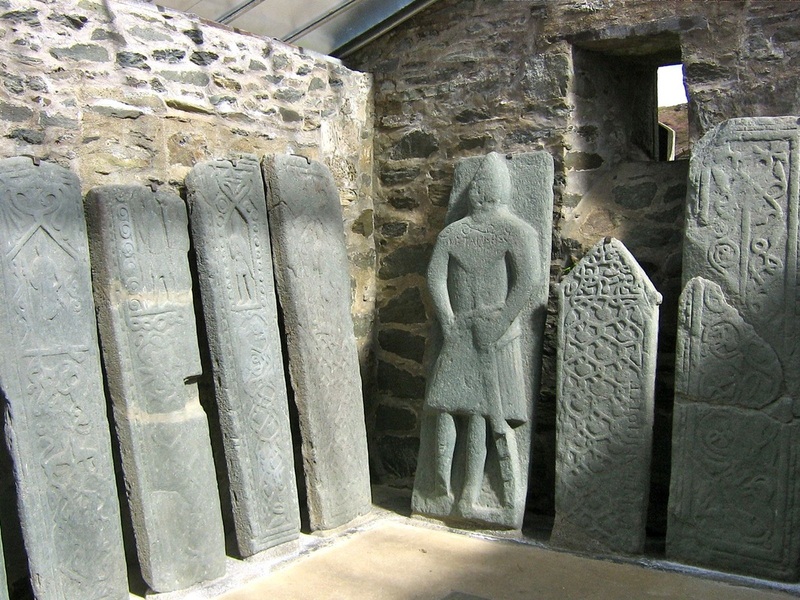 From about AD 1100 successive new architectural and sculptural styles were introduced to Scotland. The Romanesque and the later, Gothic styles resulted in a more ambitious stone architecture, which saw castles, cathedrals, churches and monastic houses rising throughout the country. 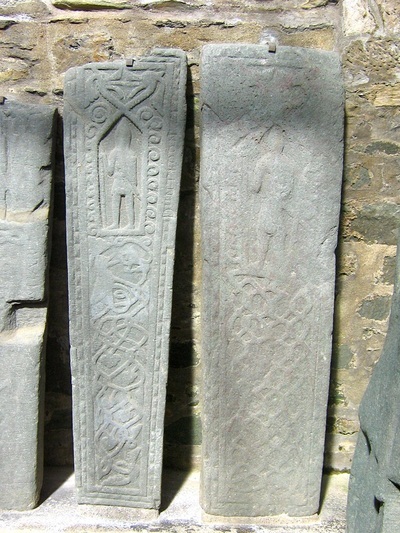 The carved stones of the middle ages take a diversity of forms: loose architectural details survive from altered or vanished buildings; kirkyard and market crosses can still be conspicuous focal points of modern communities; more discreet and elusive are boundary markers, often simple cross-marked boulders; religious imagery, depicting Christ and the saints, is a rare survivor, and often fragmentary and mutilated, having suffered as a result of the iconoclasm of the Reformation of the 16th and 17th centuries. 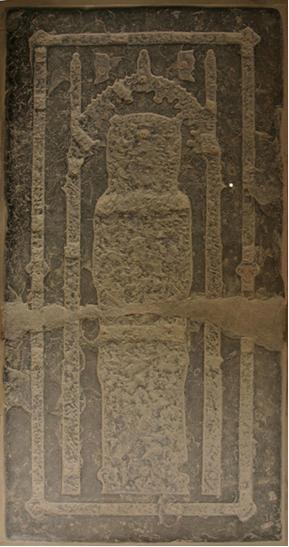 Funerary monuments took a diversity of forms: the most common are recumbent graveslabs. 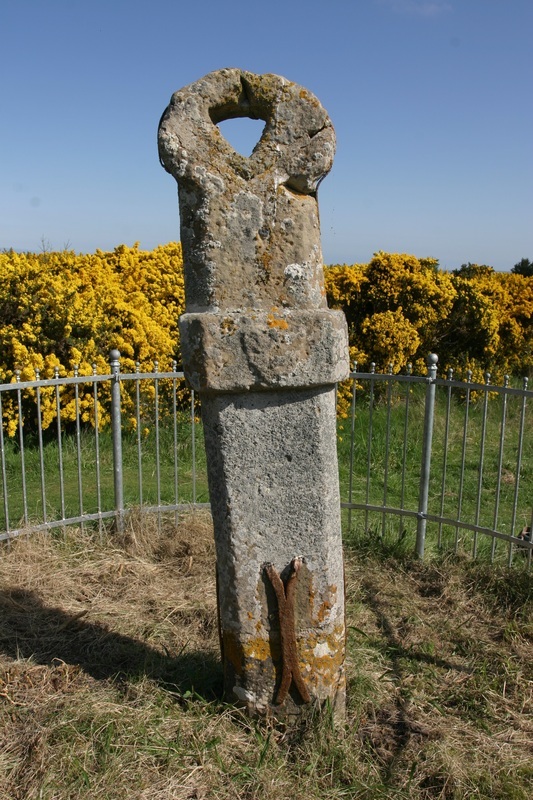 These can bear a range of motifs, commonly, a cross standing upon a stepped ‘calvary’ base. 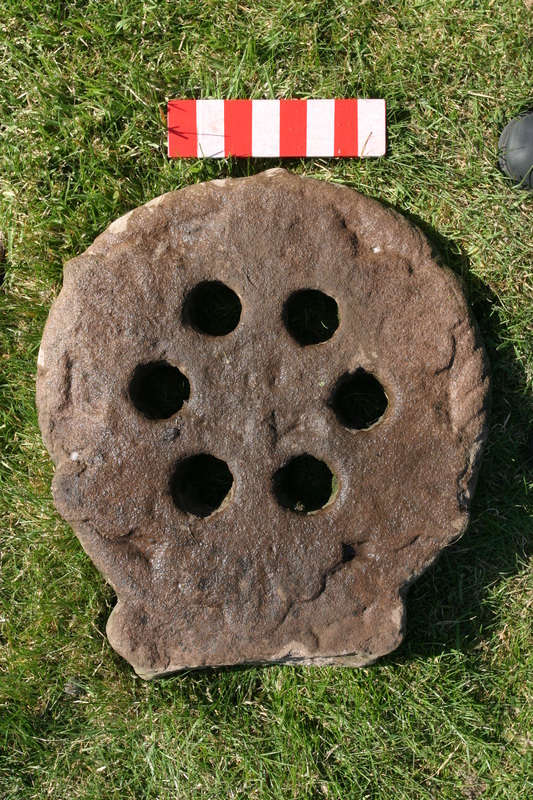 Swords, shears, axes and agricultural implements such as the sock and coulter of the plough are often found. 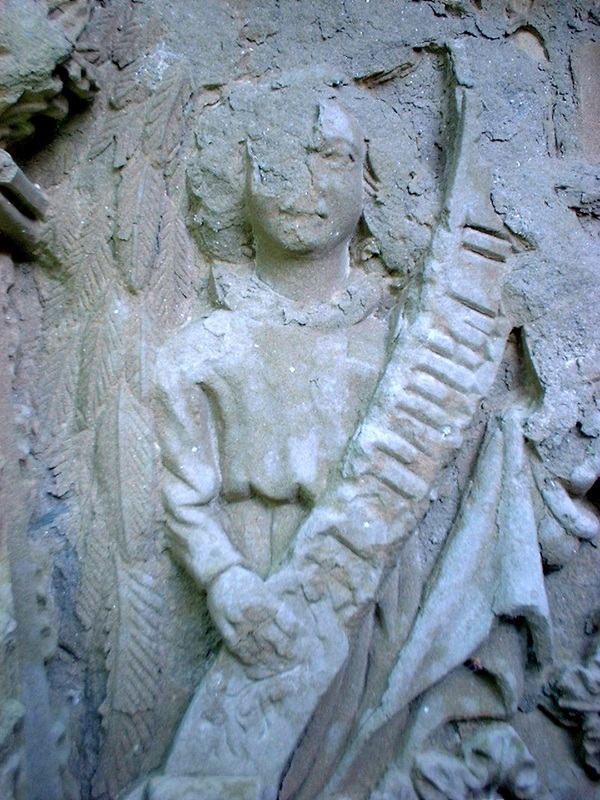 From the 13th century, images of the deceased begin to appear, at first incised or low relief on slabs, and later, three-dimensional. Typically these depict nobility, landowners, burgesses and ecclesiastics, in the evolving fashions of the time. Inscriptions add another dimension to the sculpture, and a valuable additional source of information. Not all these stones are native: Frosterley limestone monuments were imported from County Durham, and Tournai limestone from the Low Countries, the latter either bearing incised effigies, or originally bearing an engraved brass plaque. I Fraser 2013. 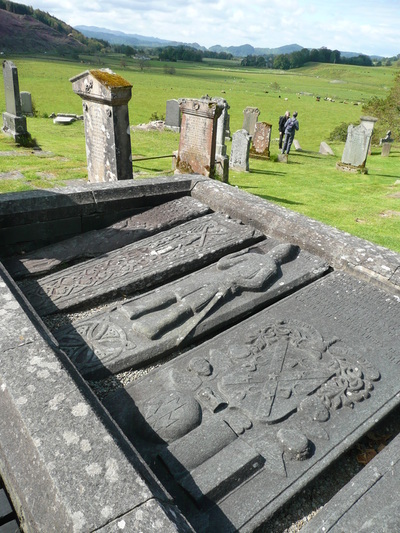 ‘Medieval Funerary Monuments in Scotland’, in M Penman (ed), Monuments and Monumentality across Medieval and Early Modern Europe. Donington: Shaun Tyas, 9–17. 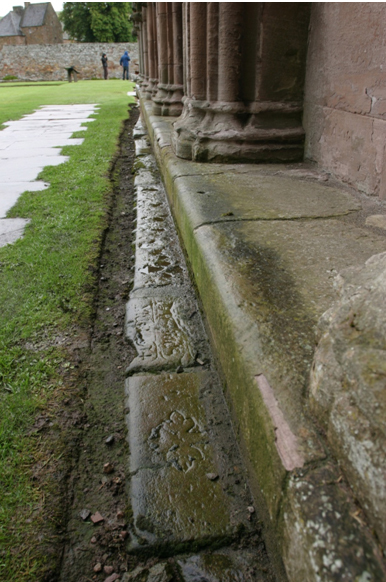 RCAHMS 1994. South East Perth: An Archaeological Landscape. Edinburgh: HMSO. J W Small 1900. 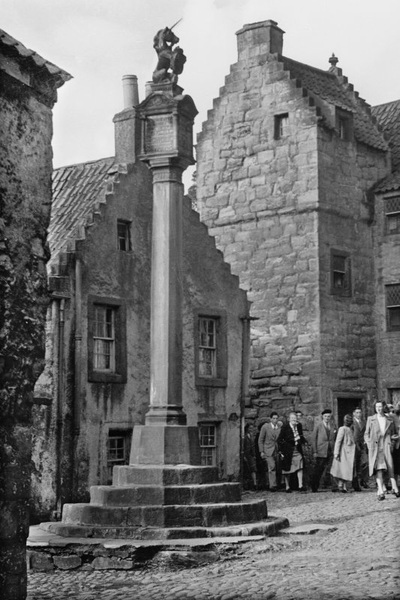 Scottish Market Crosses. Stirling. K A Steer and J W M Bannerman 1977. Late Medieval Monumental Sculpture in the West Highlands. Edinburgh: RCAHMS.